When I cast on with the Dream in Color Smooshy, I fell in love. Now that I’ve cast off, the love affair continues! I will definitely be getting more of this in the future. The Masonic Socks are finished, and will be in the hands of their recipient this evening. They’re a bit bigger than my feet need since they are for a male recipient, which is just as well since if they were my size I might be inclined to keep them. Check out that yummy stitch definition right there and please to be ignoring the one wee mis-crossed cable it means no harm it just needs love and forgiveness. It’s a bit hard to tell here with the finished socks displayed on my (makeshift coat-hanger) sock blockers, but that single cable runs down opposite sides of the leg and foot on each sock. One for the outside of each instep. 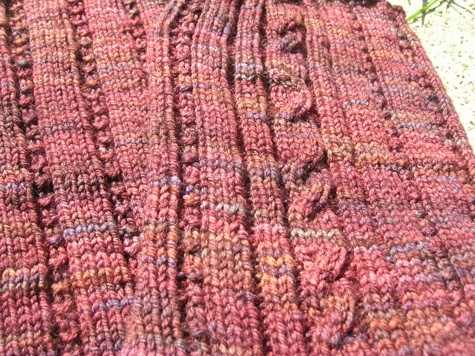 The rest of the pattern is a combination of ribbing and hidden garter rib. Mmm. 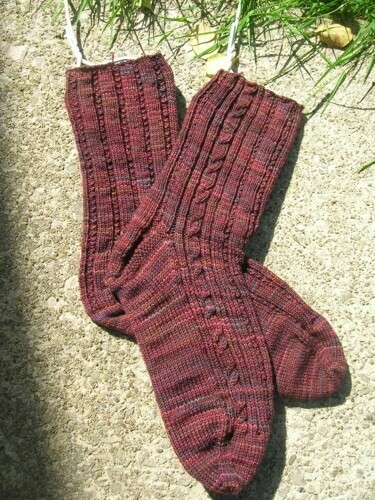 Pattern: Masonic Socks by Quelle Erqsome Knits. Modifications: I increased the stitch count from 70 to 74. I did this by turning the 4 instances of ‘p1’ in the ribbing in the chart to ‘p2’ instead, and re-centreing the heel so that it would all match up in the end. It’s possible I messed something up, but it looks good and they are symmetrical so I think it’s all OK in the end. If I were making them for me I think I would actually stick with the 70 stitches in the original pattern. The other, ahm, ‘modification’ was an unintended one. There is supposed to be an inch or so of ribbing at the top of the sock, but I totally missed it. My eyes went right past the ribbing instructions (“cuff”) and started immediately on the ribbing chart instructions (“leg”). Thankfully I think the ribbing has enough snugness on its own and I’m confident they will be worn without slouch. All in all an attractive pattern, easily memorized, just fiddly enough to be interesting, and worth knitting again. Two thumbs up! Seems to me the colorway would have worked for the first 20th century book…spooky and gothic! Great socks and that yarn is just gorgeous. Y’know, I actually rather like how they look without that “obligatory” cuff ribbing. It’s refreshing! How very cool that despite the missed rib the socks have turned out so well!! Hey, you know…the lack of proper cuff? It totally works. I’m digging it. The socks are great & I love the pattern. I also adore Dream In Color yarn & their lace yarn (Baby) is a joy to work with. Somerset likes the socks, but is disappointed that none of her namesake’s books made The List. She’s particularly fond of The Razor’s Edge. Greedo prefers Catalina – it’s shorter, which leaves more time for napping. Hurrah! They look awesome, I hope he likes them. Thank you so much for your comments, too, you totally made me blush! Great socks! I kind of like the ‘cuffless’ look- more rustic. I’ve been hearing a lot of great things about Smooshy, I’m going to have to get some! very nice – i like it without the ribbing! Lovely socks-happy birthday to you too! Gorgeous color! Those Dream in Color people are geniuses. Love how the semisolid works so nicely with the cables. They are nice, I love the colour.